Located on Historic Route 66 at the end of the Grand Canyon Railway, Williams is the T-bone junction of American travelers’ nostalgia. The town has managed to preserve the best of its past, while shaking free from its raucous reputation. 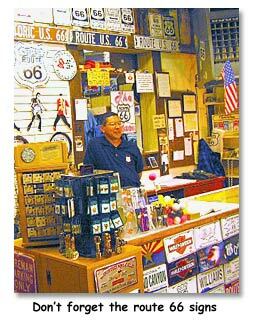 The result is a quaint blend of Old West and early rock ‘n roll, a one-stop fueling station for premium Americana. Besides the rodeos and sock hops, Williams, Arizona boasts easy access to outdoor recreation areas that can be enjoyed throughout its four distinct seasons. While many travelers continue to use nearby Flagstaff as their hub to northern Arizona attractions, quite a few are discovering that William’s small-town charm is a cozier stop on the long and sometimes arduous highways. The laid-back pace can be attributed to a lack of urban annoyances. The nearest traffic light is thirty miles away. Named for legendary mountain man William Sherley Williams, aka “Old Bill,” the town was first settled by sheepherders in 1874. Railroad workers followed in 1880 with the construction of the transcontinental railroad, later called the Santa Fe line. With the line complete in 1882, Williams grew as hub of ranching and lumber. Other profitable industries included saloons, brothels, opium dens and gambling parlors. All catered to a growing population of cowboys, Chinese labor, lumberjacks and copper miners. A general atmosphere of lawlessness helped secure considerable notoriety for Williams and its role in the Wild West. In 1901, the Santa Fe Railway added a 60-mile spur to the Grand Canyon. This scenic line, an extension of an older mining line, attracted William’s earliest tourists. More followed when Williams incorporated a segment of America’s Main Street as its own. With surrounding mines emptied of copper and hills stripped of their trees, local industries failed, yet the road and rail continued to boost the economy. However, the Grand Canyon Railroad shut down in 1968. (Now reopened) And as Interstate 40 loomed closer, threatening to divert traffic away from Williams, the little town fought to keep its stretch of the Mother Road. It resisted I-40 until October 13, 1984, opening date for the final bypass that officially closed Route 66. With a certain skill for reviving the past, Williams now thrives on renovated Old West architecture, reclaimed forests, a resurrected railway and a restored strip of 66. Williams bills itself as “The Gateway to the Grand Canyon ®,” which seems fair enough, given its direct rail to the South Rim. It also marks the starting point of the Grand Canyon Highway, the shortest route between Interstate 40 and the Grand Canyon. However, Williams has developed into a destination in itself. Listed on the National Register of Historic Places, downtown Williams maintains 19th century character while catering to 21st century shoppers. Meanwhile, hotels and cafés along Route 66 evoke neon nostalgia for the mid 20th century. Nestled at the base of Bill Williams Mountain in the heart of Kaibab National Forest, Williams attracts its share of outdoor enthusiasts. Seven fishing lakes and an endless system of hiking trails surround the town. Nearby camping, hunting, golfing and skiing facilities add to the draw. 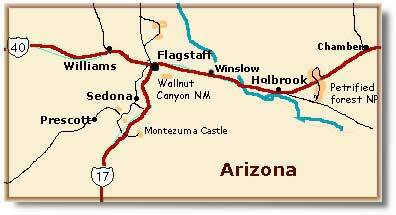 Sedona, Arizona: 65 miles southeast.